If you are thinking of making a will, it is important that you think beforehand of the provisions you wish to make, and the implications these may have on your estate. It will always be necessary to appoint one [ or two ] Executors. 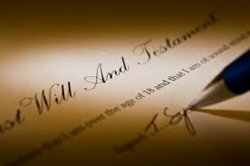 An Executor is the person who is responsible for ensuring that the provisions in your will are followed, and who will sign the various forms required by your Solicitor. This person may be a spouse, a child, relation or friend or your Solicitor or Accountant. If you are a husband and wife and intend to make a will, it is often best firstly to ensure that your property and accounts are put into your joint names. This allows your property to pass easily to the surviving spouse often without a Grant of Probate being required. Provisions can be included in your will as to how your property will pass, if and when one or both parties die. It is this area however which has given rise in recent years to Court cases, where an application is made to Court for provision to be made by the Court for a child/children who may have been excluded from the will. This is a complex area of law, dealing with disputes between members of the same family and often issues of mental competency at the time the will was made. You can discuss these matters with us on a confidential basis, knowing that you will receive expert and specific advice on your intentions. Once a will has been made, it should be reviewed every five years or earlier, depending on a change in circumstances of any of the parties involved. If you have children under 18 years of age, the names of the Guardians – these will be the people who will physically care for the children in your absence. Your bequests –the specific provisions you wish to make for the various assets of your estate. Prepare a Schedule in advance to include – Account Details, Property, Personal Items – such as Jewellery, Paintings, Furniture, etc, that you might wish to leave to specified members of your family.